Posted on Nov 24, 2011 by Appleton Downtown Inc. It's pretty difficult for a small independently owned store like Angels Forever - Windows of Light to compete with the big box stores on Black Friday. Lots of people get up at O' dark thirty and stand in line for those limited quantity specials. 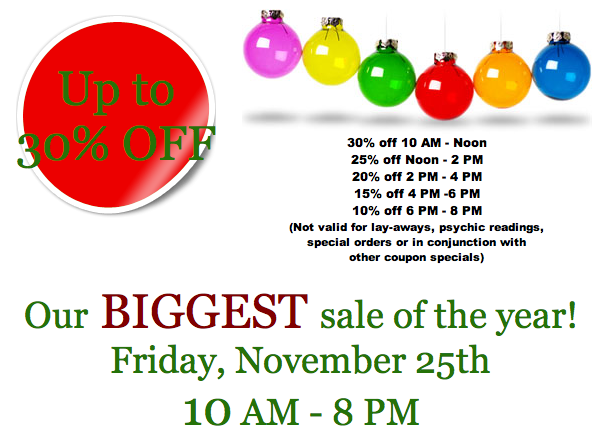 But you can sleep in late and stop into Angels Forever - Windows of Light and still receive extra savings for this store wide one day only sale! If you can't make it on Friday, American Express will give a $25 statement credit to the first 200,000 card members who register their card and use it to shop on Small Business Saturday, November 26th at any locally owned, independent small business that accepts American Express....LIKE OURS!